Many dentists view the root canal procedure to be safe, while other researchers have gone ahead to show that the procedure may allow for the growth of dangerous bacteria in the mouth as well as in the rest of the body. Research suggests that because a root canal seals the microscopic bacteria within the dead tooth’s dentinal tubules, it can lead to an extremely serious concentration of bacteria and even their leakage via the lymphatic system into the bloodstream. If your immune system happens to be weak, it has been suggested that the ensuing toxic overload could lead to several health complications such as cancer, heart disease, and lots of other systemic illnesses. A root canal tooth is essentially a dead tooth that, over time, is likely to attract infection. It is made of microtubules in their thousands that attract anaerobic bacteria. During a root canal procedure, the dental and nerve decay from the damaged tooth gets removed. However, even during the procedure, there are many microscopic tubules which never get exposed to the sanitizing chemicals used. During the procedure, the targeted bacteria get sealed off from your root canal and thus also separating them from blood flow circulation. This enables the antibiotic being used to effectively treat the affected nerve and dental area. As a consequence of the sealing, the numbers of health-stimulating bacteria get destroyed while the harmful bacteria tend to become more drug resistant. After the surgery, the millions of tiny “tubules” of bacteria in the tooth dentin, the area between the root canal and the enamel, will mutate into what is known as “anaerobic” bacteria. To thrive, these are bacteria don’t require oxygen and every tooth that has been root canal-filled has them. They occur and thrive because of the root canal filling structure –it’s entirely sealed off. No cancer treatment will kill microbes inside a root canal filled tooth. They can travel throughout your body and are responsible for the majority of chronic degenerative conditions. These include not just cancer but multiple sclerosis, rheumatoid arthritis, heart disease, ALS, lupus, diabetes and many more. When you get a root canal, it becomes the perfect place for microbes to breed. This is because nothing in your immune system can get access to the root canal as it has been sealed off. However, bacteria, viruses, fungus, yeast, mold, etc., can still get easy access to the root canal and set up a comfortable home. If you have cancer and manage to kill all the microbes found everywhere in your body except inside your root canal teeth, inevitably those microbes will eventually spread out from their comfortable haven and cancer will return. 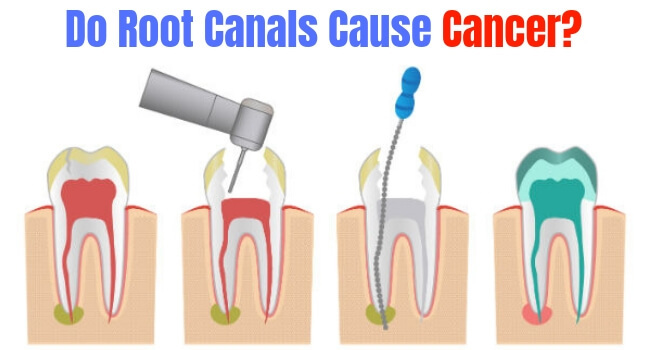 According to the American Association of Endodontists, there is insufficient evidence to conclusively prove that root canals could be associated with cancer or indeed other forms of inflammatory diseases. On the other hand, many dentists agree that even after the procedure is long over, it’s possible that some bacteria often do remain. Logically, this can lead to infections and other serious health problems that can include cancer. The subject of root canals is a tough one. There certainly doesn’t seem to have a clear straightforward explanation or a completely safe solution. However, nearly all dentists would certainly agree that the best case scenario is one where you would not need to have this controversial procedure by maintaining great oral health if that is possible. How Long Do Root Canal Procedures Usually Take? oh my gosh i had no idea there were links to cancer!